Two events happen in today’s Gospel: Jesus astonishes the people of Capernaum with his Sabbath teaching, and then Jesus amazes the people by casting out a demon. It was customary in a synagogue to invite others to read the Scriptures and comment on them; leaders would welcome a young, promising voice, and Jesus took many opportunities to express the Truth in this way (Take note that in Mark’s Gospel, Jesus never again enters a synagogue after he is rejected in the synagogue at Nazareth in Chapter 6!). What is astonishing is not the fact that Jesus is teaching but that, unlike the scribes, his teaching does not simply repeat traditional and accepted opinions of other rabbinical leaders. It is “new teaching with authority” – Jesus speaks on his own personal authority, a fact which will soon turn the scribes against him. We do not know what passage Jesus read, or how he commented on it. Mark’s Gospel contains precious little of Jesus’ actual teaching and is focused on the arrival of the Kingdom in the person and authority of Christ, and the astonishment this stirred in those who encountered him. Mark repeatedly shows us that the coming of Christ was altogether astounding, his words and actions unprecedented and challenging to the status quo, his authority, and power noted by all – even the demon who acknowledges him as “the Holy One of God.” Jesus, with authority, tells the unclean spirit literally: “Be muzzled” and orders him to leave the man. And the evil spirit must obey, stirring new amazement through the crowd. Both of these events give evidence of the power and authority of Jesus, and the widespread attention he drew. People heard him teach and saw him healing and overcoming demons and were amazed and astonished. Do we really believe in the transforming power of Christ in every facet of our being? Are we truly open to the God of surprises, opening ourselves fully to a sincere encounter with the living God? Are we still capable of wonder and amazement at the peaceful presence of God in each moment? Are we able to celebrate the bright moments of grace in our lives and in the lives of others? Let’s all ask for the great gift of recognizing and marveling at the mighty power and authority of Christ, which can be found everywhere we turn: in the sky and the sea, in the hearts of those we encounter, in the seed and bloom and fruit of the earth, and in every tabernacle that holds the very Presence of God in the Eucharist. Kathryn Mulderink, MA, is married to Robert, Station Manager for Holy Family Radio. Together they have seven children (including Deacon Rob and seminarian Luke ;-), and two grandchildren. She is a Secular Discalced Carmelite and has published five books and many articles. Over the last 25 years, she has worked as a teacher, headmistress, catechist, Pastoral Associate, and DRE. 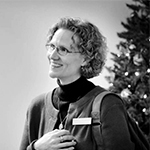 Currently, she serves the Church as a writer and voice talent for Catholic Radio, by publishing and speaking, and by collaborating with the diocesan Office of Catechesis, various parishes, and other ministries to lead others to encounter Christ and engage their faith. Her website is www.KathrynTherese.com.